House & Garden A&B coco base nutrient requires an extremely precise composition of the various minerals. House & Garden coco nutrients are coco specific nutrients which contain far less potassium than other nutrients to take into account the high levels of potassium released from the coco media during the growing cycle. The special composition of the nutrient solution leaves the water reservoir pure and keeps it fresh. At the same time it provides an excellent balanced nutrient ensuring optimal absorption at the root zone. House & Garden Coco base nutrient is composed of liquid nutrients and trace elements and contains no bulking agent. This makes the transfer from the root zone to the plant easier. Coco base nutrient is composed of the purest high-quality nutrients that are available on the market to date, including Eddha-Fe (iron). This enables the plant to absorb the nutrient quickly and effectively. 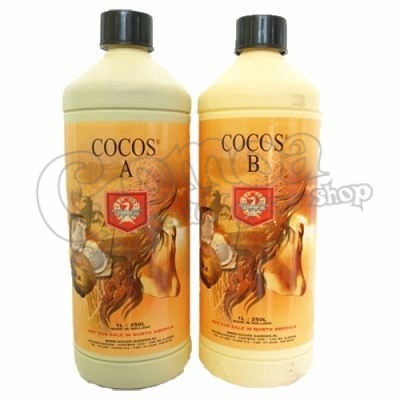 In short if you want an excellent start for your plants use House & Garden A&B Coco. House & Garden base nutrients contain a full range of beneficial elements. Humic and Fulvic acids improve the uptake and transportation of nutrients which in turn will promote healthy plant growth and the absorption capacity of the root zone. Adjust the pH value to harmonise with the nutrient solution. Use House & Garden pH+ (up) or pH- (down) as this has been developed specifically for use with House & Garden nutrients and will give you a longer and more stable reading. For best results use House & Garden Coco coir. Do not add A&B at the same time, as this will trigger a chemical reaction in the nutrient, resulting in solidification of some parts of the nutrient and causing incomplete nourishment for your plants. Also this could cause some blockages in irrigation piping.